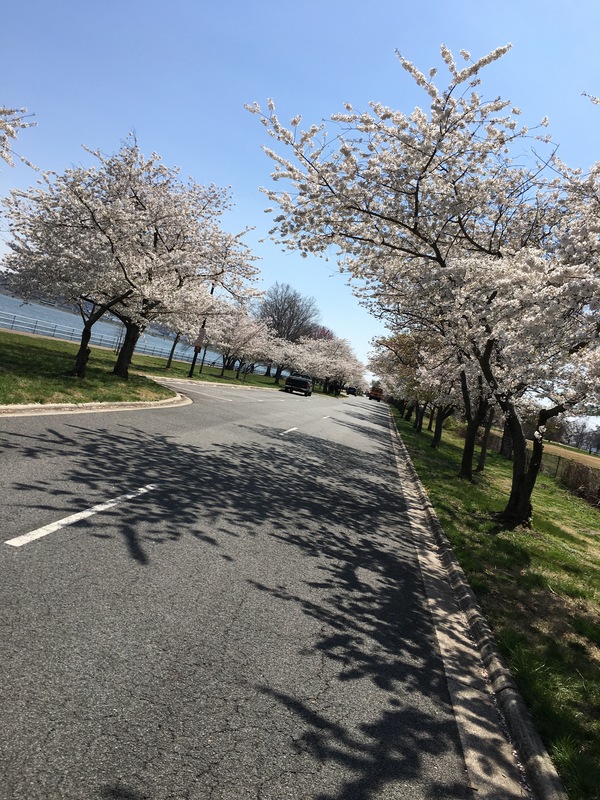 4/12/2018 East Potomac Park, Washington, DC. I just came back from a refreshing three mile run. For the first time in a long while I was able to run in almost perfect weather – 75 degrees with very little humidity and with a strong but cool breeze. I am running short distances for a month to get my right foot completely healthy. It is okay during normal activities or short runs but starts feeling gimpy after 6 miles or so, and I am worried that it would get injured seriously if I don’t get it healed now. The last time I ran over 6 miles was during the 17.75K (11.03 miles) race organized by the Marine Corps on March 24th, one that I wrote about in the previous post. I wanted to run it last year also because it gives a chance to register in the Marine Corps Marathon without having to depend on the lottery. But last year I missed the short window of registration for this race. They opened up registration for the marathon itself, about 20 minutes on the 21st, and I was able to register for the marathon (Yeay!). Thus the purpose of this 17.75K race for me was defeated before I started nevertheless I was glad I ran because it was quite an experience. The race is run almost entirely in the Prince William forest park near Marine Corps base Quantico. I had booked a room in a cheap hotel in Dumfries, VA near Quantico and about 40 miles south of DC. The hotel was near a park and ride lot from where shuttle buses took runners to the race starting point. It was to start at 7 am, or else I might have driven on Saturday (the same day) morning. After finishing my 3pm to 4pm class I rushed downtown to catch a commuter bus run by the Potomac and Rapahannock Transit to Potomac Mills. I wanted to pick up my race bib at a running store there because I didn’t want to have to get up early enough to pick it up on race morning. The race organizers also discourage that. I found the bus stop after some trouble. The drivers and passengers were very friendly and helpful in directing me to the right spot. The approximately 31mile trip took almost an hour, even though it ran on I-95. Most of that time was taken up in just getting out of downtown. I got to the store late but luckily they were still handing out bibs. After eating a good dinner at Subway I caught another PRT bus to Dumfries. I must say I was impressed by the efficient operation of this transit service and if I do this next year, which I hope to do, I would certainly take the bus again. I thought I would be able to sleep well and went to bed early but somehow even for a small and not so important race there was lots of anticipation and excitement. Perhaps it was also just all the hustle and bustle of the trip and the excitement of getting out of town. Anyway, I did what I did for the marathons- just lay in bed and tried to relax as much as I could. I probably really slept for about two hours, but woke up not feeling terribly sleepy. The deep relaxation must have helped. It is something I learned from mindfulness workshops. More on those below. Anyway, I decided to get up at about 5 am because I simply got tired of lying on bed. I got to the shuttle bus stop around 6am. Even though it was almost spring the temperature was around 30 degrees. This year as with all recent years because of climate change and the disruption of the Arctic vortex the weather has been just weird and abnormal. Even the cherry blossoms have been delayed. After about ten minutes on the shuttle bus we arrived at the parking lot of a church where the nearly 3000 runners were gathered. I wanted to go the bathroom but the lines were too long. I was happy when the race started at 7am. The way it was set up those at the back just had to wait for those ahead of us to move and it seems like there were lots of slow runners in the front because we ran the first mile in well over 10 minutes. I myself was running much slower than I thought I was running. Perhaps it was the combination of the cold weather and the gravel terrain and the congested race. While running in the forest would have been pleasant and enjoyable at any other time, the early morning cold weather and the rolling hills made the race rather difficult and uncomfortable. After about two or three miles the crowds thinned out and I was able to increase my pace until I got to about 9 minutes per mile. My normal racing pace is closer to 8 minutes but I was glad to get this particular race over and the good news was that even though it was aching a bit in the second half my right foot felt manageable and the pain went away almost right away after the race. I even got into a bit of a full sprint foot race in the last quarter mile with another guy. That was fun and we congratulated each other at the finish line as we crossed it, almost simultaneously. Even though the travel and the cold early morning running was difficult, overall it was a fun experience. Given the current atmosphere in the country I was a bit apprehensive about how people in an exurban area would interact with me. This trip and the race alleviated those concerns quite a bit. I returned home feeling optimistic about the American people. It was a good recharge and reset for the body, mind and soul. Another experience that was uplifting was the environmental film fest movie “Chasing the Thunder” about two ships operated by the Sea Shepherd group chasing illegal fishing vessels. It was inspiring to see young people dedicate their lives to a very demanding and dangerous job motivated by a passion to save the ocean and the fishes. This could be a model for the environmental movement. What we need are projects where people could feel like they are accomplishing something and making a difference. Merely protesting, while necessary, is not enough to sustain a long-term movement. Certainly for me, mindfulness is what has sustained me and kept me motivated even during difficult moments. On Sunday the 18th of March I participated in a “Day of Mindfulness” as part of the annual Mindfulness in Education conference. It was organized by a dear friend, mentor and inspiration Richard Brady. Being with others practicing loving-kindness and being present in the moment and slowing down the mind was really valuable. It brought me back to the knowledge and feeling of all beings being one and looking at every person as a child of God. This feeling and attitude helped me through some difficult times during the following weeks. In his book “A New Earth” the wonderful Eckhart Tolle articulates beautifully how not being in the present is the nature of our ego and the cause of our identity of ourselves as being different from others. The moment we bring ourselves completely to the present, the ego dissolves away. Slowing down the mind and being in the present has been my main goal in the recent years, because I realize that by doing that I can overcome the obstacles I have been having in learning, dealing with people, etc.,. I inherited a certain restlessness and impatience as well as a zest for life and pleasure in simple things such as taking a walk or a hearty meal or watching a game and other blue collar tastes and sensibilities from my father. From my mother I inherited an obsessive attention to detail and concentration, an almost fanatical devotion to duty and loyalty and a pathological persistence. My father thinks in stream of consciousness and gets through life with his acute observational skills. My mother is blessed with a terrific memory and is also more analytical and systematic in her thinking. My entire life has been a struggle to gain some sort of balance between these opposing tendencies and proclivities. Mindfulness and running have helped me tremendously in this struggle during the past several years. I have also been blessed with a partner in life, my dear Nicole, who tends to balance me out in many ways and is not afraid to point out when I am going wrong. Meeting her was definitely one of the most important and consequential turning points in my life. I cannot imagine how my life would be today without her in it. Last week we were driving from DC to the Shady Grove metro station area in MD where my sisters live. We drove on the scenic GW parkway with views of the Potomac ravine. It brought back memories of our third date, in late June of 2009. We ate at California Pizza kitchen, then walked in a drizzly, cloudy evening to the Spanish steps near Dupont circle and sat there for a while enjoying the scenery. Then we drove up GW parkway and stopped at one of the scenic overlooks. I remember exactly how I felt that evening, a new feeling of confidence as well as love, a feeling that I was not sure at that time that I would ever develop. When you are not sure in your own heart, in the depths of your consciousness, whether you love yourself or not, then it is also difficult to love others. Until that time I always felt like I was fighting to win the approval and love of others. I don’t know why that was, but I never felt quite confident in my dealings with other people, especially women. Certainly I had been blessed with the love and affections of many people including women, starting with my parents, my aunts and uncles, my sisters as well as many dear friends. Yet with a few exceptions it was never clear to me if that love included respect and a complete understanding of who I was. With Nicole it felt different. I felt like she accepted me and understood me at a deeper level, almost from the beginning. I felt confident in my feelings for her and in my sense of her feelings for me. Perhaps that was partly the effect of romance, but whatever it was, those feelings and the intuition we had about each other have withstood the test of time and the usual vicissitudes of life and marriage.